All you can eat pizza and pasta? Sounded like a fool's game to me. That's what they offer at Ambiente Pizza Nuova near Náměstí Republiky. 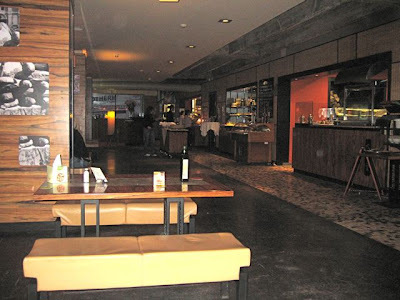 I'd been to the spacious, cafeteria-like restaurant a number of times. But each time, I avoided the pizza and pasta. 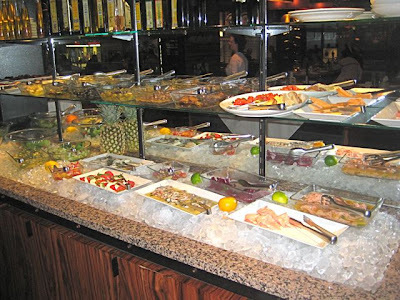 Instead, I got the "try as much as you can" antipasti buffet (285 CZK). It was not a typical salad bar, with lots of quality stuff. They had a variety of salads like Caprese. 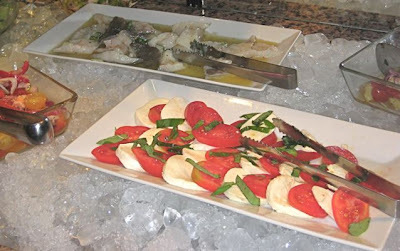 But there was also grilled and non-grilled vegetables, marinated fish, beef carpaccio, and several cheeses, including a giant block of Parmigiano-Reggiano that you can chip away yourself. And bread, too. I always thought this was a great deal and one of the healthier options in the area. 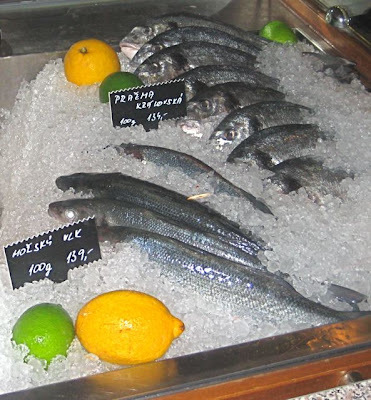 Right next to the salad bar, fresh fish on ice is out for inspection. But for some reason, the thought of stuffing myself to the gills with pizza and pasta didn't appeal to me. I wasn't planning on running any marathons, and felt no need to explore my carbo-loading limits. 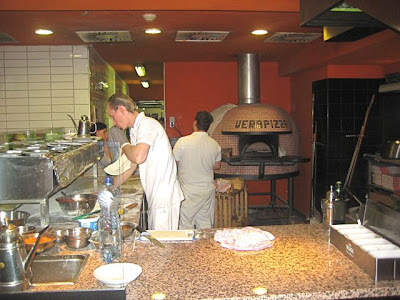 The full title of this Ambiente restaurant is "La Verace Pizza Napoletana," and I wanted to test the claim on their oven that it's the real thing. I went with G-Man and a couple of other people. He got the Pizza Diavola (185 CZK). The menu says it comes with spicy Ventricina salami, fresh cow milk mozzarella, San Marzano tomatoes, fresh basil, Grana Padano cheese, olive and sunflower oils. It was one of the best European-style pizzas I've had in Prague. Very close in quality to the one we had at Naples' Da Michele. There was a nice char on the crust from the hot oven. If there was one big fault, it was that the oil caused the crust to go soggy rather quickly. I then tried the Pizza Marinara (155 CZK). This was THE best pizza I've had in Prague. I know this is a classic style in Italy, but I'd never tried one before. Until this experience, I had held a irrational and preconceived notion that it couldn't be a pizza without cheese. How wrong I was. This pizza was just amazing, my hands down favorite. 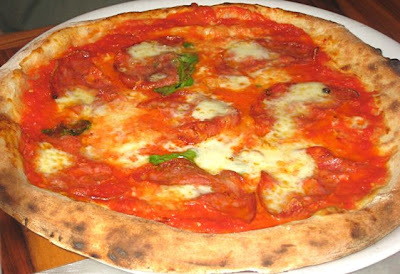 The imported tomatoes, along with the basil, were very good on the Diavola, but they were muted and overshadowed by the cheese and pepperoni. On the Marinara, these flavors were up and singing. When combined with the slightly blackened, fully crisp crust, I could not get enough of this one. With my low expectations effectively raised, I decided to return another day for the unlimited pizza and pasta option (295 CZK before 6pm - 328 CZK after 6pm). This time, G-Man got the Pizza Margherita Classica (188 CZK). You can also get it with bufala mozzarella (245 CZK). The Classica still had a slight soggy crust issue in the middle, but flavor-wise, it was top notch. 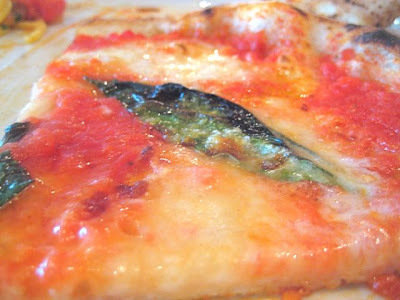 I'd even recommend this simpler pizza over the Diavola. But the Marinara remains my favorite. Once I set the all-you-can-eat machine in motion, the food came fast and furious. Almost too fast. You can always turn down something on offer, but when I came in, hungry and curious, I took on everything. The servers carry small pans with freshly cooked pasta. I imagined it would be bad, but it really was well executed. 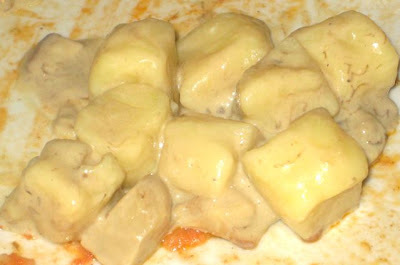 The gnocchi with porcini and cream had really distilled the lovely taste of the mushrooms. I much appreciated the Penne Alla Checca. 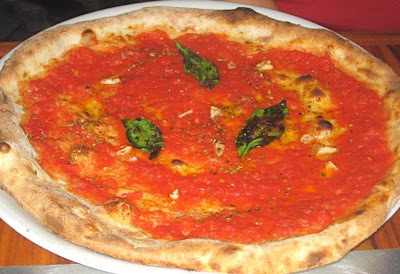 The flavor of the tomatoes and basil had the similar enticing intensity found on the Pizza Marinara. There was also mozzarella and extra virgin olive oil in the mix. 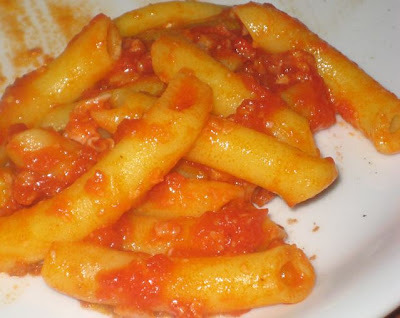 I had Penne All´Amatriciana. The tomato flavor stood above the barely noticeable pancetta. But there was a respectable sharpness from the chili peppers. I really enjoyed the Ragu Napoletana fusillata. Veal and pork were slow-cooked with red wine, basil and Grana Padano cheese into a fork-tender mound. It was a little salty, but oh so rich in flavor. 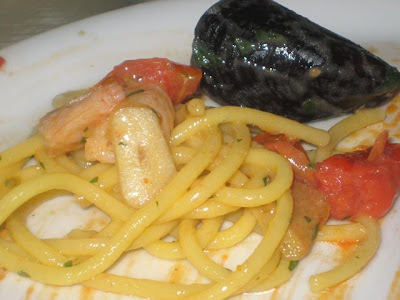 The seafood pasta was fresh and delicious. It had a coating of olive oil and, interestingly, what I thought might be a hint of orange, but could not be sure. It was superior to most of the bland versions I've had elsewhere. There was a Penne Alla Tagliata. It was simple but delicious with good quality beef, rucola, tomato, garlic, Parmesan, and rosemary. With every dish I tried, the pasta came out al dente, never overcooked. Things went less well on the pizza side. I took on the Capricciosa. 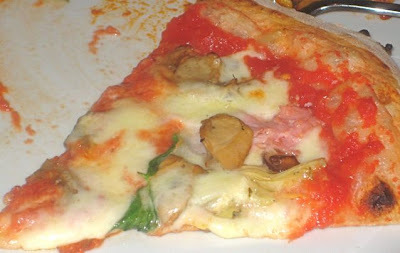 The slice had a small amount of mushrooms, ham, and artichokes. But as I indicated before, with these pizzas, less is more. Again, it got limp pretty fast, and it is a shame to cover up the quality that lies underneath. 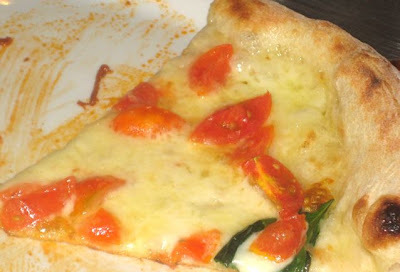 I had a white pizza with cheese, with only chopped fresh tomato and basil. This was much better. The flavors were more clear, the crust more crisp. While getting all the pizza and pasta I wanted was no problem, getting drinks was another matter altogether. We were drinking beer. They have Staropramen. I was drinking Granat. They also serve Stella Artois. 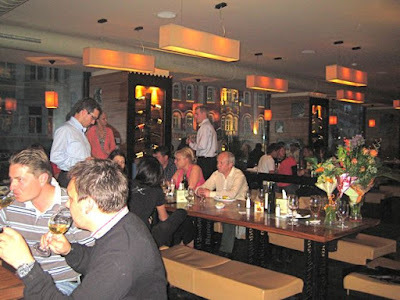 It appeared that different waiters were responsible for drinks. On both visits, it was hard enough to get the first round delivered. The second round proved near impossible. 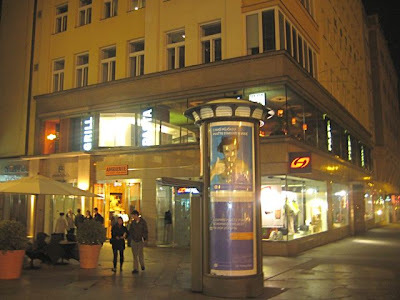 In fact, on our second trip, I had to chase down the manager to order a beer. And it still never arrived. As we asked for the check, I told him to cancel it. He realized his lapse and apologized profusely as we left. Yes, I started with low expectations and was very pleasantly surprised at the great quality that came along with the great quantity of food. They really do pack a lot of great flavors into almost every dish. That can't be easy when there are so many different variations going to so many customers, one pan at a time. I'd love to go back for the Pizza Marinara. And almost any of the pastas, but perhaps the Ragu Napoletana. 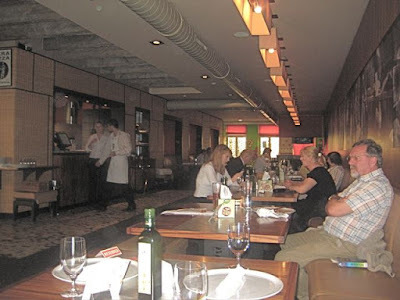 It was great to be able to sample such a wide range of dishes for such a good price. But I wouldn't do it again. I felt less than well when I was done. Rumors to the contrary, I’m no eating machine. And in the all-you-can-eat game, it’s hard to beat the house, however good the cooking. I always end up eating too much and leaving full of both food and, yes, a little remorse. I agree more or less about the food. The service is just .. weird. We've been waiting 20 minutes for the dessert. After that finally there was a waiter who stopped at our table. We reminded our order. Another 20 minutes of waiting. Nobody stopped and asked, if we want something, I was even waving. Total ignorance. I can understand that in a rush our, but the restaurant was half empty. Finally, a waitress saw us. I said, that we've waiting for the dessert already 40 minutes and we would rather just go and pay now. She disappeared. After 5 minutes, she returned again with the dessert and the bill. No word of excuse, but on the bill, the dessert was not included. As I said, weird. I agree completely with what you've said here about the service. 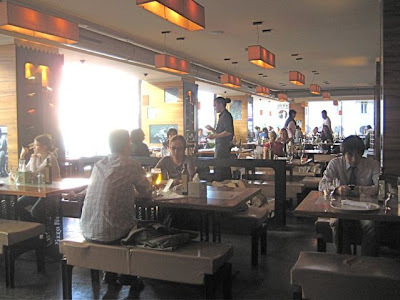 When we arrived we were seated by a waitress who didn't have menus to give us, then someone else arrived and gave us menus, but disappeared too quickly to take drink orders. When he then returned he took orders for beers and pizzas. The pizzas arrived but we had to ask someone else to remind them about the beers, which finally arrived maybe 10 mins after the food. Odd. Too much oil on the pizzas does make them a bit soggy too, and gives the bases an almost "pancakey" texture. I thought the food was ok, and the service really poor.